Local crafts include carvings, batik, wall hangings and leather products. Local textiles and designs are also available. Stamp collectors should note the excellent Philatelic Bureaux in Basseterre and Charlestown. Nevis' hot pepper sauce, ranked among the Caribbean's best, is a good take-home item and can be found in local markets and stores. Shopping malls on St Kitts include TDC Mall and Pelican Mall. For something more authentic swing by at the Anima Craft Market, which showcases the handiwork of local artisans. Friday and Saturday are the busy market days, and visitors should not miss the chance to witness the abundance of exotic food stalls (near the Basseterre and Charlestown ferry docks). The Caribelle Batik factory at Romney Manor, St Kitts (tel: 869 465 6253; www.caribellebatikstkitts.com) is fabulous for fabrics; visitors can buy some wonderful clothing and textiles, or just watch how they are made. Longtime St Kitts resident, Kate Spencer, from England, sells and exhibits her watercolours and oil paintings at Rawlins Plantation, Mount Pleasant (tel: 869 465 6221). Meanwhile, the Spencer Cameron Art Gallery, 10 North Independence Square (tel: 869 664 4157) in Basseterre focuses on West Indian art. The Eva Wilkin Gallery, located in an 18th century windmill at the Clay Ghaut Estate, Nevis (tel: 869 469 2673), features drawings and paintings by the beloved Nevisian artist. Duty-free shopping is centered on the Port Zante docks and The Circus in downtown Basseterre, which is within walking distance of the capital’s cruise port. Mon-Sat 0830-1200 and 1300-1600; some shops close early on Thursday. 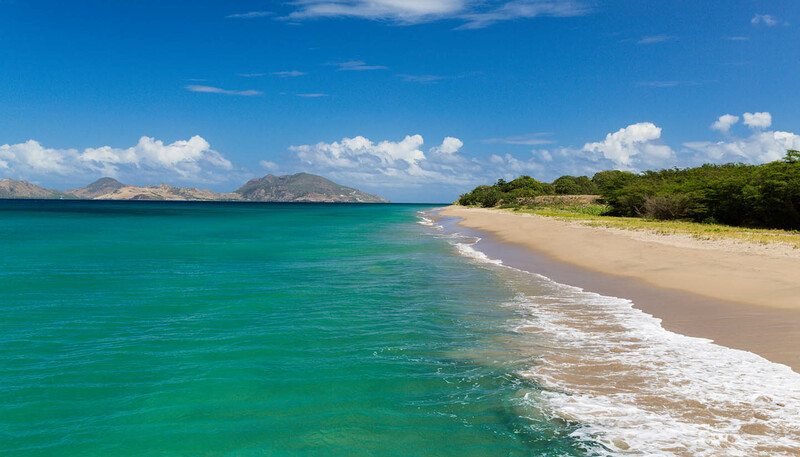 ‘The Strip’ in Frigate Bay, St Kitts is lined with an eclectic collection of lively beach bars and restaurants offering everything from potent cocktails and grilled lobster to live music and dancing. Vibes Beach Bar (tel: 869 465 8423) and Mr. X's Shiggidy Shack are among the local hot spots. A number of hotels and inns have string or steel bands playing on Saturday nights in the peak season. Frigate Bay is also home to the Royal Beach Casino at the St. Kitts Marriott Resort (tel: 869 466 1200; www.marriott.com), which has table games, roulette and slot machines. In Nevis, most nightlife centers on the island’s dozen or so lively bars. Standouts include Sunshine’s Beach Bar, Lime Beach Bar and Double Deuce, which are located on Pinney’s Beach. Entertainment can also be found in local inns and hotels.